Don’t just take our word for it, here are some testimonials from our past customers endorsing the personal service they received when placing an order, and the quality of the end product. Hi Jane, thank you so much for all your help, everything looks wonderful! And thank you for your very kind wishes – yes hopefully we will get a bit of sun which will be good! We have a few friends getting married soon and I will definitely recommend your services! Thank you so much. 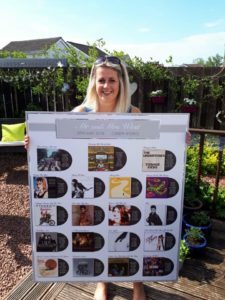 Hi Jane, I received my plan today, thank you so much I love it and its exactly how I wanted it. 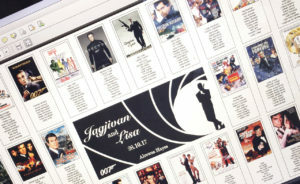 We’ve received the table plans and table cards. They look lovely and we’re very happy with them. The colours are great and stand out well! Thank you for all your help and putting up with our many changes! We had an absolutely fabulous, it really was perfect!!! Thanks for making it so special for us, people loved the plan! Thank you! Thanks again for all of your help Jane, A* service! From my very first enquiry, the time, effort and attention to detail that Jane provided me with was absolutely fantastic. 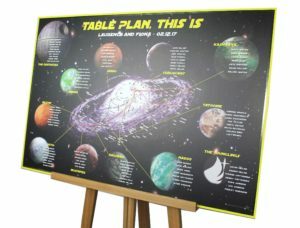 The whole process through from selecting an initial table plan to putting it into production was so easy. Jane’s personal attention to my requirements meant that I always felt relaxed and at ease that everything was being managed to a high standard and that I never had to worry. 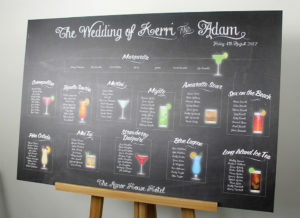 When you are planning so many different things for a wedding this just makes things so much easier! 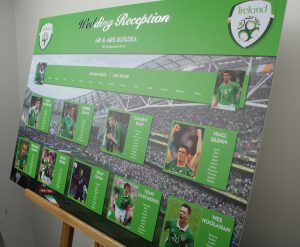 The final product was great, on the day people were having pictures with our table plan and also taking home the table cards as well as a memory of the day! I cannot recommend Jane’s service highly enough. Wow!!!! 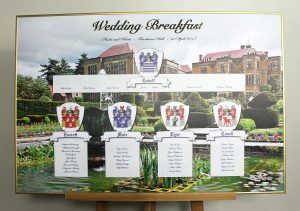 The table plan and table cards are absolutely amazing!!! You have done us proud! We can’t thank you enough. Your speed and priority was second to none. Thank you so much from the bottom of our hearts. Hi Jane, we received the delivery yesterday and we are extremely happy with the final product! It looks absolutely amazing and very good quality! We love the teal colours incorporated into it too it will fit our wedding perfectly. 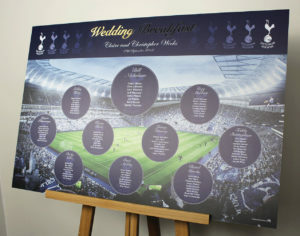 Of course we will send pictures of it in situ, and we will let you know how the big day goes! 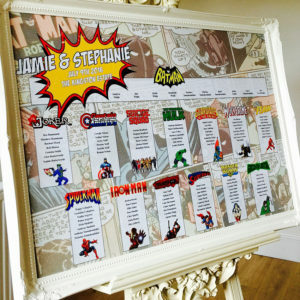 Hi Jane, We just wanted to tell you about our guests’ reaction to our table plan on our wedding day! They absolutely loved it and we saw lots of people taking photos of it and a lot of people stood for ages looking at it! 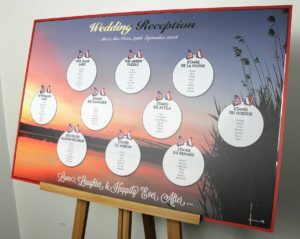 It was so nice to look around the room as well and see all our table name cards just how we wanted them to look. Hi Jane, ee are both over the moon with what you have created, its exactly how I imagined it in my head and we are so grateful that you took the time to help us create this. 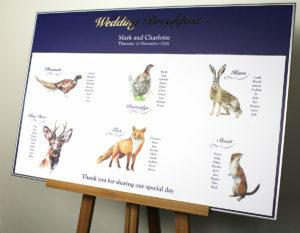 Jane designed our place names and table plan for our wedding reception recently. She has been absolutely amazing and a pleasure to liaise with. Jane was always so prompt to reply to my emails, listened to exactly what I wanted and was very patient with my indecisiveness, designing various versions for me to help make up my mind. I was so pleased with the quality of the products and they looked fantastic on the day! 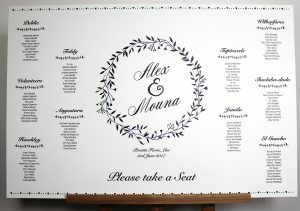 I really would recommend Jane in a heartbeat for anyone looking for wedding stationary! 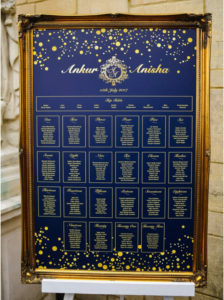 Table plan arrived, it’s absolutely amazing. Thank you so much. 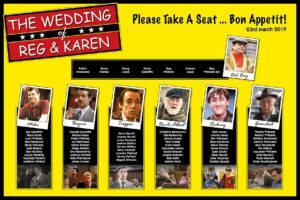 Best table plan ever!! Hello Jane, we can’t thank you enough..You took our random idea and transformed it into a masterpiece!! 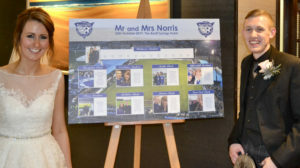 It was fantastic that you were able to continue our “family” crest theme through all the stationary, order of service, timeline card, table cards and name cards … Everything was amazing. The table plan – which we opened together on Sunday evening– is absolutely amazing, better than we could have ever imagined. Peter was gob smacked – which is most unusual! You have been so helpful throughout the process and we are so excited about revealing the table plan to our guests – all the West Hams fans will love it I’m sure! Yes we received it and we are absolutely over the moon with it it. It is perfect. Thank you so much for all your help.